As I’ve come to enjoy baking more and more, my family seems to have taken notice. For birthdays, holidays and other celebrations, family members place early dessert orders so that I have ample time to come up with something good. My dad’s birthday was mid-April, and the order was placed: something chocolate and maybe ice cream? With strawberries? You know me. I’m always looking for an excuse to make something chocolate. At the time, I happened to have Boston Cream Pie on the brain and it occurred to me that, hey, if Boston Cream Pie is so good, wouldn’t it be even better if it had more chocolate? It just so happens that Boston Cream Pie is one of my dad’s favorites (and mine too), so that was settled. The only problem was that I couldn’t find a suitable recipe for Chocolate Boston Cream Pie. Everything I found used boxed cake mix and boxed pudding mix. There’s nothing wrong with those things, but it takes some of the fun out of it for me. I like to bake from scratch when I can and this special occasion called for some extra effort. So I took a bunch of completely different recipes, mixed and matched, made some tweaks, and ta-da! 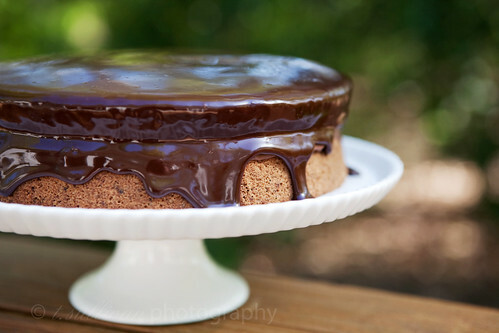 A recipe for Chocolate Boston Cream Pie. Wait! Don’t let the length of this recipe scare you. It can be divided into fairly simple make-ahead tasks over several days. Bake the cakes the first day, and once cooled to room temperature, wrap tightly in plastic wrap and foil and store in the freezer. Make the pastry cream the second day and store in the fridge. Remove cake layers from the freezer the morning of your event. Assemble and glaze the cake about 1 hour before you are ready to serve. See? That’s not so bad! Cake Assembly: Set the bottom Chocolate Sponge Cake (recipe below) layer on a cake plate, dish, or other serving platter. Top with a thick layer of Chocolate Pastry Cream (recipe below), spreading smooth into an even layer. Top with the remaining cake layer. 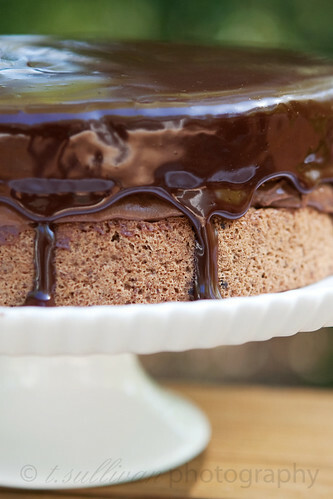 Pour Chocolate Glaze (recipe below) in the center of the top of the cake, and using a spatula, work toward the edges until it spills over the sides. Let sit at room temperature for about an hour, until glaze is firm. Serve immediately, or store covered in the fridge until ready to eat. Preheat oven to 350°F. Spray two 9-inch cake pans with baker’s spray and set aside. Whisk flour, cocoa powder, baking powder, and salt together in a medium bowl (or sift onto waxed paper). Heat milk and butter in a small bowl at 30 second intervals in the microwave until butter melts. Add vanilla, cover with plastic wrap and keep warm. Separate three eggs, putting the whites into the bowl of a stand mixer and reserving the three yolks in a small bowl. Add remaining 2 whole eggs to the bowl of yolks. Using the whisk attachment, beat the egg whites on high speed until foamy. Slowly add 6 tablespoons of sugar, continuing to beat until whites form soft, moist peaks. (Do not over beat!) Transfer egg whites to a large bowl. Add yolk/whole egg mixture and remaining 6 tablespoons of sugar to the mixing bowl. Using the whisk attachment, beat on medium-high speed (setting 8 on a KitchenAid) until eggs are very thick and pale yellow, about 5 minutes. Pour beaten eggs into the bowl of egg whites. Sprinkle the flour mixture over beaten eggs and whites. Gently fold flour mixture into eggs with a spatula until about half combined – about 12 to 15 strokes. Make a little well on one side of the bowl and pour in milk mixture. Continue gently folding until batter flour is incorporated and eggs are evenly mixed. Pour batter into prepared cake pans and bake at 350°F for 14-16 minutes, or until tops are light brown and spring back when touched. Remove from oven and run a knife around the edges of the pan to loosen the cake. Invert cake on a cooling rack. Cool completely. Fill a very large bowl with ice and cold water. Set a (smaller) large bowl inside the ice water to create an ice bath. Set aside. Place chopped chocolate in a small microwave safe bowl and heat on 70% power at 30 second intervals, stirring between each interval, until almost melted. Continuing stirring until smooth. Set aside. Bring the milk to a boil in a medium saucepan. In the meantime, whisk together yolks, sugar and cornstarch together in a medium bowl. When the milk has reached a boil, remove from heat. Whisking constantly, slowly add a couple spoonfuls of the hot milk into the yolk mixture to temper the yolks. Keep whisking, slowly pouring the rest of the milk into the tempered yolk mixture. Place a fine mesh strainer over the saucepan and pour mixture through strainer back into the pan to remove any scrambled eggs. Whisk vigorously and constantly over medium heat until the mixture returns to a boil. Continue whisking for 1 to 2 minutes more, until the mixture thickens to a pudding or curd like consistency. Remove the pan from heat and immediately stir in the melted chocolate with a spatula. Transfer the pastry cream into a the large bowl of the ice‐water bath you set aside earlier to stop the cooking process. Continue stirring the mixture so that it remains smooth. Once the pastry cream has cooled to about 140 F (warm, but not hot) remove from the ice‐water bath and stir in the butter in three or four installments. Once the butter is completely combined, return the pastry cream to the ice‐water bath to continue cooling, stirring occasionally, until it has completely cooled. Use (or eat) pastry cream right away, or store in the fridge in an air-tight container with plastic wrap pressed against the surface for 2-3 days. In a small saucepan over medium heat, bring the cream and butter just to a simmer. In the meantime, place chopped chocolate in a small heat-proof bowl. Once at a simmer, pour the hot cream over the chocolate and let it sit for a 2-3 minutes. Stir until smooth. Cool for a few minutes at room temperate, until thickened but still thin enough to pour. I was looking for a chocolate sponge cake recipe to use for a strawberry shortcake layer cake. This looks perfect! I love combining different recipes into one new product. I feel all the accomplishment of creating my own recipe without the risk of trying to make something from square one. Boston cream pie donuts were always my favorite kind of Dunkin Donuts. I think you may have just made the concept infinitely better with your chocolate version. My friends and family place dessert orders as well! I love coming up with desserts that best suit their tastes and personality. It’s so much fun. yum! i could eat it all if i had a bottomless stomach! Oh what a lovely cake recipe! Looks incredible! Very pretty. I’ve never made one but yours looks lovely! I’ve never made boston creme and love that you used chocolate cream! This is absolutely stunning! Wow.